Unilever PLC operates as a fast-moving consumer goods company in Asia, Africa, the Middle East, Turkey, Europe, and the Americas. The company operates through four segments: Personal Care, Foods, Refreshment, and Home Care. The Personal Care segment offers skincare and haircare products, deodorants, and oral care products. The Foods segment provides soups, bouillons, sauces, snacks, mayonnaise, salad dressings, margarines, and spreads. The Refreshment segment offers ice cream, tea-based beverages, weight-management products, and nutritionally enhanced staples. The Home Care segment provides home care products, such as laundry tablets, powders and liquids, soap bars, and various cleaning products. 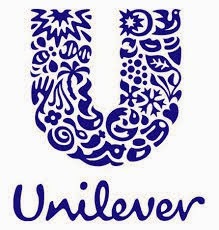 Unilever PLC offers its products under various brand names, such as Axe, Becel, Flora,Ben & Jerry's, Bertolli, Blue Band, Rama, Brylcreem, Cif, Clear, Comfort, Domestos, Dove, Fissan, Heartbrand, Hellmann's, Amora, Knorr, Lifebuoy, Lipton, Lux, Omo, Pond's, Radox, Rexona, Signal, Closeup, Simple, St Ives, Sunlight, Sunsilk, Surf, TRESemmé, Timotei, VO5, and Vaseline. The company was founded in 1885 and is headquartered in London, the United Kingdom. Unilever PLC is a subsidiary of The Unilever Group. Unilever currently pays a dividend of $0.368 per quarter for a $1.47 annual dividend. At the close of market on Friday, December 13th UL’s price per share was $39.13. This gives the stock a current dividend yield of 3.76%. Normally I look for a dividend yield of at least 3%, so I will be satisfied with this dividend yield from UL. In 2003, Unilever paid an annual dividend amount of $0.40 per share. The dividend trend has been up each year, except year 2008 Unilever cut their dividends. This gives UL a 10 year annual compound dividend growth rate of 12.61%. Unilever has increased its dividend now five years. 5 years annual compound dividend growth rate is 5.97%, for 3 years, 11.34% and for 1 year it is 7.65%. Unilever's EPS has grown an average of 15.79% over the past 10 years, -21.77% in the past five years. 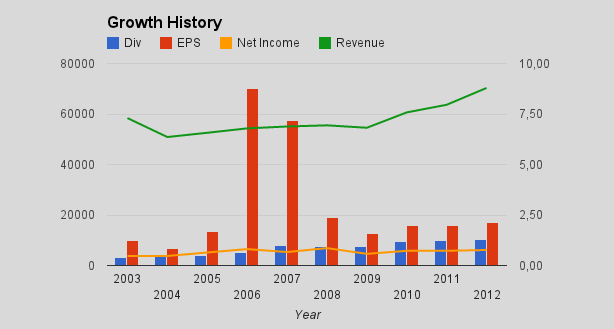 The past three years, EPS has grown 9.59%, and in the past year growth has been fair 5.48%. Unilever's EPS of development in recent years makes me convinced at the moment. Analyst estimates for 5 years earnigs growth rate per annum are 0.7% (http://finance.yahoo.com/q/ae?s=UL+Analyst+Estimates). Unilever's net income has increased by an average of 7.71% over the past 10 years, 2.84% in the past five years, 9.96% in the past three years and 5.36% in last year. Unilever's revenue has decreased -0.61% over the past 10 years, increased 4.98% in the last 5 years. In the last 3 years, profits have grown 8.83%, and last year 10.45%. Unilever`s amount of shares has varied a lot. From year 2003 those increased, but from year 2004 to year 2009 those decreased nicely. After year 2009 amount of shares has increased again every year. I would like to see amount of shares go down every year, or at least stay on same level, because less shares outstanding, my shares are giving me a larger portion of the earnings. Unilever's dividend payout ratio has been in the past 10 years by about 42.45%. This means that Unilever has distributed almost half of the profits to shareholders. Payout ratio for last 5 years are 56.27%, for last 3 years 60.71% and last year it was 62.15%. 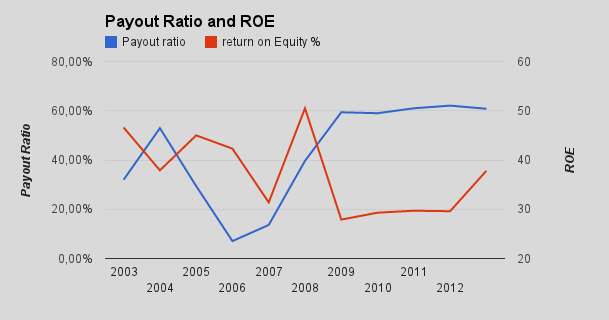 Payout ratio has grown up fast on years 2008 and 2009, after year 2009 it has been around 60%. which are still ok for me. Unilever's ROE has been over 30% over the past 10 years, which are very good. Current ratio measures the company's ability to meet short-term obligations. Unilever has current ratio 0.77 at the end of 2012. This means that the funds will be able to cover 77% of current liability obligations. I usually like the current ratio is greater than 1, so Unilever don´t looks fine in this case. This number tells me how many years it will take to pay off the current long term debt of the company by using all net profit into it. I want this ratio to be less than 5, because the company is able to pay for all long-term debt from less than five years and on my opinion the company don´t have too much debt. Unilever`s long term debt has been under 5 times net profit on last 10 years. In the last 10-year average is 1.81, last year it was 1.42. To found out share fair value I mainly use six different methods. (http://www.passive-income-pursuit.com/search/label/stock%20valuation%20method). Unilever`s current P/E are 18.7, which are close to it`s historical 10 years average high (20.74) and even over 5 years average high(17.70). By calculating using estimated EPS $2.16 for year 2013 and the average 5-year low P/E ratio shares fair value will be $26.28. Using the 10-year average low P/E ratio, fair value will be $32.68. Unilever`s current annual dividend are $1.47. At the close of market on Friday, September 27th UL’s price per share was $39.13. This gives the stock a current dividend yield of 3.76%. Average 5 years high dividend yields has been 5% and average 10 years high dividend yields has been 3%. Those dividend yields gives share fair value $28.88 for 5 and $39.42 for 10 years. Unilever`s current P/S ratio are 1.64 with revenue estimates for year 2013 (69.75B). Average 5 years low P/S ratio are 1.15 and average 10 years low P/S ratio are 1.39. By calculating using estimated revenue for year 2013 and the average 5 years low P/S ratio fair value will be $27.51. Using the 10 years average low P/S ratio, fair value will be $33.15. Analyst estimates for 5 years earnings growth rate per annum are 0.7%. I will use on my calculation 66% of that, which are 0.46%. Then I assume that continue growth after 5 years will be 3%. I use discount rate 10% and EPS $2.22. That will give me share fair value $29.28. Unilever`s current annual dividend are $1.47. I assume that Unilever will be able to grow dividends for the next 5 years at the lowest of the 1, 3, 5, or 10 year growth rates or 15%. In this case that would be 5.97%. Then I assume that after 5 years grow rate will be 5%. To calculate the value I used a discount rate of 10%. That will give me share fair value $32.19. Unilever has EPS 2.22 (ttm). When I calculate Unilever`s future price with analyst estimate for 5 years EPS growth and using low P/E ratio last 5 years, I came for price $27.99. Based on my analysis, I think Unilever are ​​currently overvalued, and I am not prepared at this time to buy any shares of Unilever. If the price would fall down to near $32, then I might be interested add it to my portfolio. Disclosure: I do not own any shares of UL. Thanks for linking to my stock valuation series. I know when I was starting out I struggled to find information on valuing stocks and knew I wanted to have a series that I could point people to if they wanted to learn. I hate trying to value foreign companies because that just adds another layer to the complexity. I really like UL was thinking of purchasing, but I guess I need to do a much more thorough look and see how they plan to keep on the growth path. I know they're working on getting rid of non-core brands, so it'll be interesting to see how a leaner more focused company does. There's just so many brands under their control you pretty much can't walk down a cleaning/personal care aisle without having multiples of their products on the shelves. Nestle is another company that I want to own in the future, but I think they're a bit on the high side too, plus I don't like the annual dividend, would prefer quarterly but semi-annual would be nice too. Thanks for the analysis.